…however, I do forsee that it’s going to cause problems down the line. For one, with the weight of the vehicle and the sort of terrain it will be going over, the force of every single bump will be transferred to this differential. Over time I think a geared design would need a lot of maintenance to be reliable. Not only this but the differential has to be placed in line with the pivot point of the rocker-bogie. This means that the seat, batteries and motors etc all have to fit around the differential. The differential takes precedence. To overcome this I’ve been developing a differential bar which will be mounted at the back of the wheelchair so it fits around the chair and batteries, and not the other way around. This video shows the initial concept. The idea is simple; the bar is fixed in a central point and to the two rockers. As one rocker moves up, the differential bar pivots and pushes the other rocker down. Unfortunately it’s not as simple as I’d first thought though. As you can see in the videos, the differential bar moves through the rockers because it has a fixed length. To overcome this, I thought about a sliding mechanism that could sit between the rockers and the differential bar. In this video I’ve added a chequered pattern to the differential bar to make it easier to see that the blue parts attached to the rockers slide along the differential. Unfortunately, this wouldn’t work either and I’ve created another video to demonstrate why. In this video, you can see that the differential wouldn’t be able to have a fixed point on the rockers. To emphasise this the ends of the differential are highlighted with blue arrows and I’ve added red arrows to the rockers. As the rockers move up and down, you’ll see that the red arrows move backwards and forwards. This highlights the fact that it wouldn’t be possible to attach the differential directly to the rockers. To make it easier to visualise what’s going on and try to find a solution I’ve made the following video. It’s clear to see in this video that the rocker and the differential pass further through each other as they become horizontal but somehow their connection needs to follow the dotted line in order to be effective. To overcome this problem the first thing that’s obvious is that the two parts shouldn’t be slicing through each other to begin with. By shifting the white part upwards, the two parts no longer intersect. 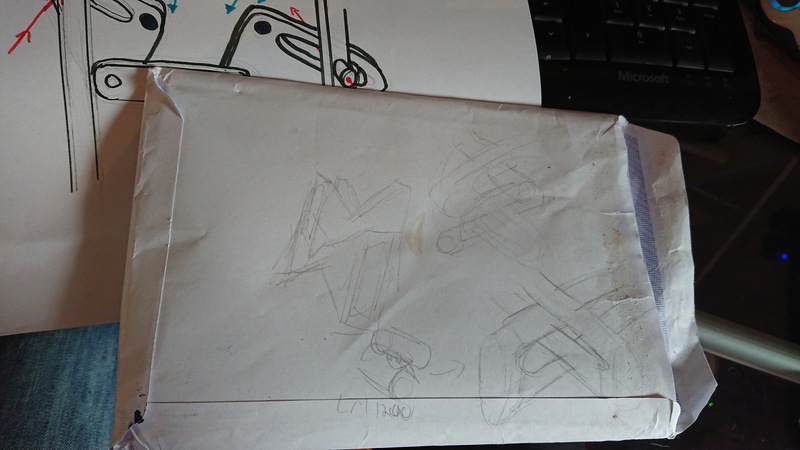 The next task then is to develop some kind of sliding mechanism that will sit between the two, queue pencil sketches on the backs of envelopes covered in coffee stains! Whatever solution I come up with, just like the geared differential, it’s going to be under a lot of force so needs to not create a weak link in the system. Rather than talk about all of my scrapped ideas, I’ll wait until I’ve got a working solution and update but I expect it will involve a couple of ball joints.